The Jaguar XE, in the released publicity material and spy shots, looks exactly like the larger XF and the flagship XJ. This is a common practice among all the manufacturers partly due to economies of scale and partly due to the fact that it is easy for them to adapt a successful design across all their models to retain familiarity of product. 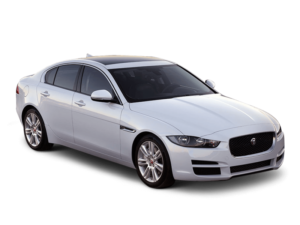 The Jaguar XE will get a smaller version of the XF’s massive chrome mesh grille complete with the leaping cat. Standard features are expected to be projector headlights, LED daytime lights and projector fog lamps. We even expect that the bumper will remain the same but with a higher ground clearance. The side profile is also similar to that of the XF in terms of roof line, flared wheels arches and the rake angle of the roof line both in the front and back. However, while the boot will have similar design elements as the XF and XJ-like tail lamp cluster and chrome strips, it appears to be far smaller (in relation to the larger cars). The rear bumper is expected to be a little sportier and will be complemented by dual exhausts. The Jaguar XE got the highest safety rating, 5 star in the Euro NCAP test. It comes with the usual package of safety features which are more or less standard across the segment. The lightweight aluminium structure of the car is supported by high strength steel in impact areas which gives solidity to the car. The sales and service network of Jaguar is limited when compared to the German trio but they are expanding steadily. Yes, the current Jaguar owners haven’t been happy with the service quality but the Tata owned brand is committed towards customer satisfaction.